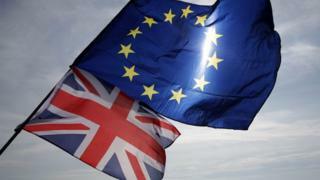 Business and union leaders from across the UK and Europe have joined together to plead for "pace and urgency" in Brexit negotiations. The CBI and the TUC along with their European counterparts are calling on the UK government and the European Union to make "measureable progress". The groups say the UK and the EU must "put economic interests and people's jobs, rights and livelihoods first". In a joint statement, they said: "We are calling on the UK government and the EU to inject pace and urgency in the negotiations, bringing about measurable progress, in particular a backstop arrangement to avoid a hard border in Ireland. "Decisions will be needed in June and October to finalise the withdrawal agreement and the transitional arrangement, and put economic interests and people's jobs, rights and livelihoods first." Carolyn Fairbairn and Markus Beyrer, the director-generals of the CBI and BusinessEurope respectively, as well as Luca Visentini and Frances O'Grady, the general secretaries of the ETUC and the TUC, met earlier this month in London to discuss Brexit. Ahead of the European Council meeting they said: "The UK government and the EU will need to agree on all aspects of regulatory alignment, which is of the utmost importance, without jeopardising the integrity of the single market." A spokesman for the UK government said: "We absolutely agree. That's why we have put forward workable proposals to the EU on a range of areas from the backstop to security, and the White Paper - which will be published after June Council - will continue to drive this process forward. "We are confident that we can make progress if both the EU and UK engage constructively."